baseball · Jun 4 Trailblazers Baseball Team is Semi-State Bound! The Trailblazers are headed to semi-state! 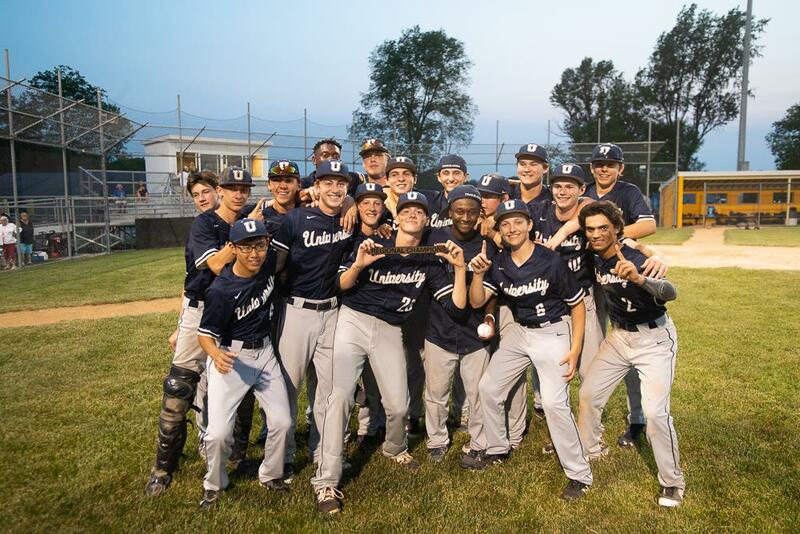 For the first time in University High School baseball history, the Trailblazers earned a regional championship and a spot in the top four teams of IHSAA Class A. The Trailblazers faced Lutheran High School and Hauser High School in regional match-ups. They defeated Lutheran 9-4 with junior Brock Moore and senior Garrett Hill pitching, and later on with senior Cade Carlson at the mound, the Trailblazers defeated Hauser 3-0. It was a whirlwind Saturday for the six senior members of the UHS baseball team. In between their 10 a.m. and 7 p.m. games in Morristown, IN, the seniors rushed back to Carmel to participate in their class’s commencement ceremony. The Trailblazers will face Tecumseh in the semi-state match-up on Saturday, June 9 at 1 p.m. The semi-state game will be played at Plainfield High School, and tickets are $8.